It’s a new year, so it’s time to try new things. And I highly recommend Las Iguanas restaurant – they’ve got a new menu, and it sits perfectly alongside their other yummy dishes and drinks. With branches practically all over London, including Spitalfields, the Brunswick Centre, Stratford, the O2 and many more, the most centrally located is located on the busy walking path between Charing Cross Bridge and Waterloo Train Station. Right next to the Royal Festival Hall – it’s a pathway where people are in a rush to catch their trains home, so they’re focusing on either the north or south of the river train station. Well, I highly recommend a stop at Las Iguanas because there is so much on offer you’ll have a hard time deciding what to eat, so will need to go back just to satisfy your curiosity. Their new menu has an excellent selection of new dishes that must be tried. First and foremost may I recommend the Seco de Cordero (Dry Lamb) – but it is not dry at all! 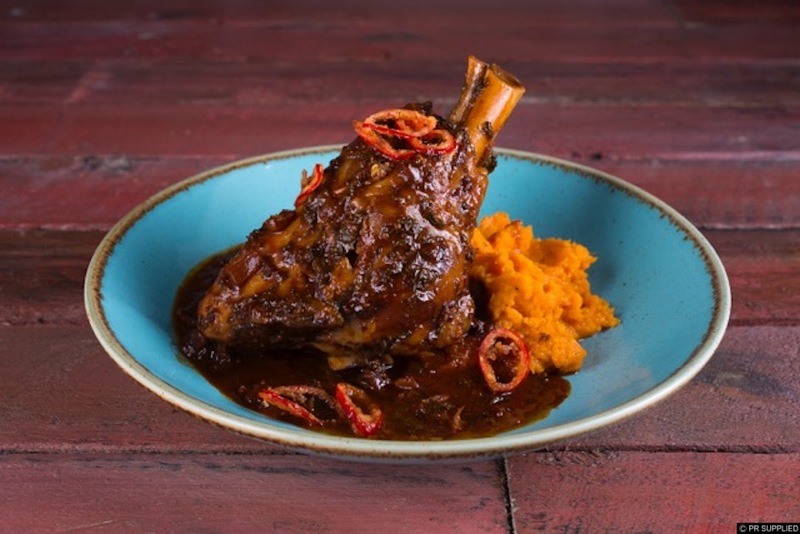 It’s a lamb shank (a huge portion), slow cooked in a golden ale, red wine and Amarillo chilli sauce, served with amazing roasted sweet potato mash & crispy chilli and onions, and at only £18.95 it’s worth every pound! From their Mexican menu, try their Vegetarian Burritos. It’s sweet potato, butternut squash & chickpea chilli all nicely rolled up in a wheat tortilla and also stuffed with rice, refried beans and comes with crunchy slaw & cheese with salad, sour cream, guacamole & roasted tomato salsa on the side, and that’s a whole lot of food for only £10.50. How about going for something entirely different and try a Cuban Sandwich. If you’ve never had one before, I highly recommend one. It’s Roasted pork belly, Emmental cheese & ham with sweet mustard & green pickle relish layered in a buttery toasted bun, with slaw & choice of fries or salad (£10.50). Also very very different is the Cauliflower & Corn Quinotto. What’s a Quinotto? It’s Peruvian-style quinoa risotto that comes with smoked cheese, roasted cauliflower & charred baby corn, topped with puffed quinoa & crispy chilli (£9.95). Besides these amazing (and new) dishes, Las Iguanas still also serves your favourites from Brazil. Dishes like Bahian Coconut Chicken being one of them, Cuba (Havana Club & Jerk BBQ Pork Ribs – yummy! ), Argentina (Gaucho Steak will do nicely thank you), and Mexican (Enchiladas, Chilli Con Carne, Fajitas, etc.). I mean there’s just so so so much on the menu I could go on and on…like, for instance, their amazing Taco Planks where you can mix and match what type of filling you want. Tortilla chips & dip while you are waiting to order; as well as of course Nachos, Calamari, Mussels, salads – there are just too too many to mention. And speaking of a mention, you also need, need, to try their Piña Colada Mess for dessert. 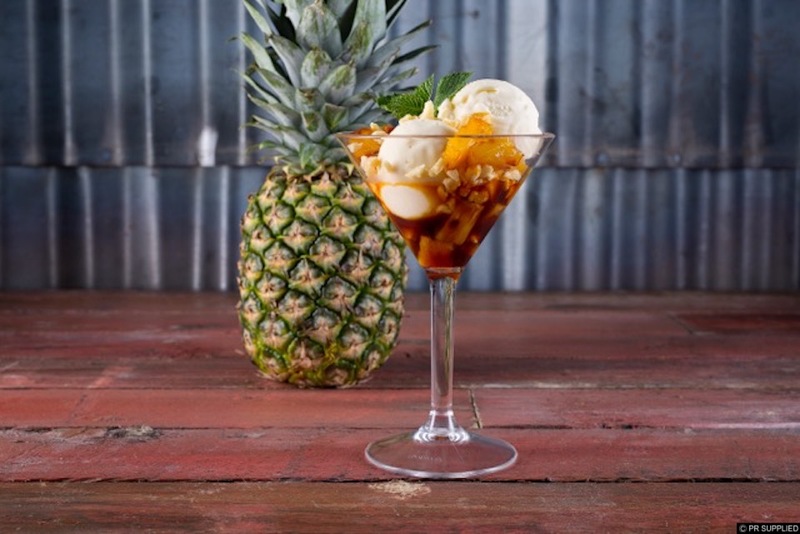 It’s Piña Colada ice cream with caramelised pineapple salsa, crispy pineapple pieces & toasted coconut chips (£5.50). Now, why else would you go to a Latin Amercian restaurant if you weren’t going to sample their drinks, and Las Iguanas has it all. From their refreshing Strawberry Daquiris to their amazing Mezcal Watermelon Smash, and of course, you really need to have one of their Mojitos if you are feeling Cuban, or if you are feeling a bit Mexican than of, course have a Margarita. I urge you, urge you, to have a look at the drinks menu as you will not be able to narrow your choices down to five – there’s just so much to choose from. ← Where are the Lesbians in Mainstream Hollywood Rom-Coms?